Nanoscientists would love to have an instrument which would allow them to see what they were doing while they picked individual molecules up and moved them around. At the moment researchers can manipulate individual molecules with scanning probe microscopy techniques, and high resolution transmission electron microscopy allows structures to be visualised with resolutions better than an individual atom. A major grant has recently been awarded to a team of UK scientists to combine these technologies, developing instrumentation that combines nanoscale actuators with high resolution electron microscopy. 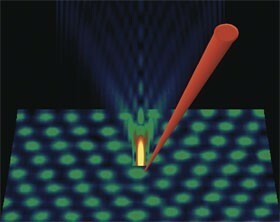 The result should be a new tool for manipulating single atoms and molecules while they are being imaged, with atomic resolution, in three dimensions. The ��2.3 million ($4.4 million) grant comes from the UK government’s Basic Technology Program. It is led by Beverley Inkson and Guenter Moebus here at the University of Sheffield, and also involves the nanoscience group at the University of Nottingham. The image is a simulated interaction between an electron beam and a surface, showing the size of the electron beam to scale with the atoms making up the surface. The immediate uses that are foreseen for this technology are mostly as a nanoscale research tool, with applications to research in nanoscale electronic, magnetic and electromechanical devices, the manipulation of fullerenes and nanoparticles, nanoscale friction and wear, biomaterials, and systems for carrying out quantum information processing. More details can be found in this one-page PDF. I would like to suggest another use for this device, controlled nano-polymerization. You may be able to use the nano-actuators to position monomers or oligomers then use the electron beam to induce a very controlled form of polymerization. Perhaps we might be able to reach the goal of being able to create arbitrary 3-D nano-structures of highly cross linked polymers. It’s certainly true that with an electron beam and a dirty vacuum you can quite effectively write structures on a surface by polymerising the pump oil residues, and I think there’s a slightly more controlled process in which you have a surface coated with silicone oil (which can diffuse very fast across surfaces) and write a structure by cross-linking the silicone, with the supply of oligomers being constantly replenished by surface diffusion. I suspect that a barrier to making this sort of process better controlled, with a more deliberate pre-placement of monomers, is that an electron beam is a very blunt instrument for doing chemistry with, in which both the primary electrons and emitted secondary electrons set off a very complex cascade of reactions resulting in all sorts of mobile free radicals which wander off causing random mayhem. Next Next post: Is mechanosynthesis feasible? The debate moves up a gear.